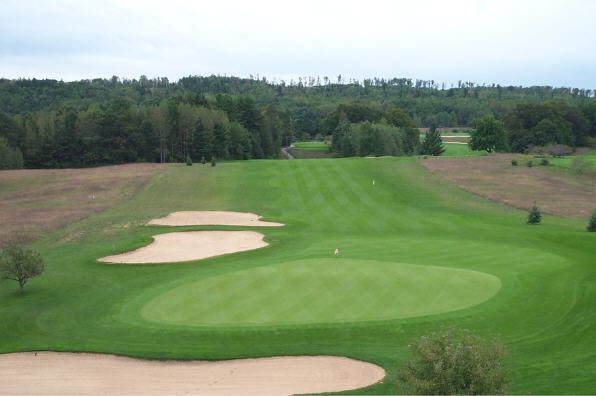 Set amongst the highlands and rolling hills just south of Portage Lake, this Jeff Gorney designed course winds through stands of hardwoods, pines, and orchards. The breeze from nearby Lake Michigan leaves little doubt that you’re up north. The fairways are thick and lush, and the greens are soft enough to hold well placed approach shots. There are four set of tees on each hole with total yardages ranging from 4437 to 6569. Scratch players will be challenged by a slope rating of 139 from the tips. Average golfers will need to play well and execute solid shots to score below their handicap, from the blue tees. However golfers of all levels will find The Heathlands to be playable and enjoyable. A practice range and two putting greens are available so players can warm up before their round.